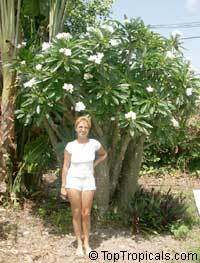 Plumeria hybrids - many varieties, Grafted ? 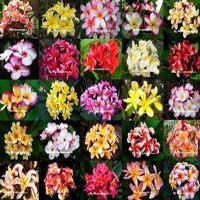 Check many varieties we have in stock, CLICK HERE. Malabar Peanut, Guiana Chestnut. Beautiful flowering tree with edible nuts. 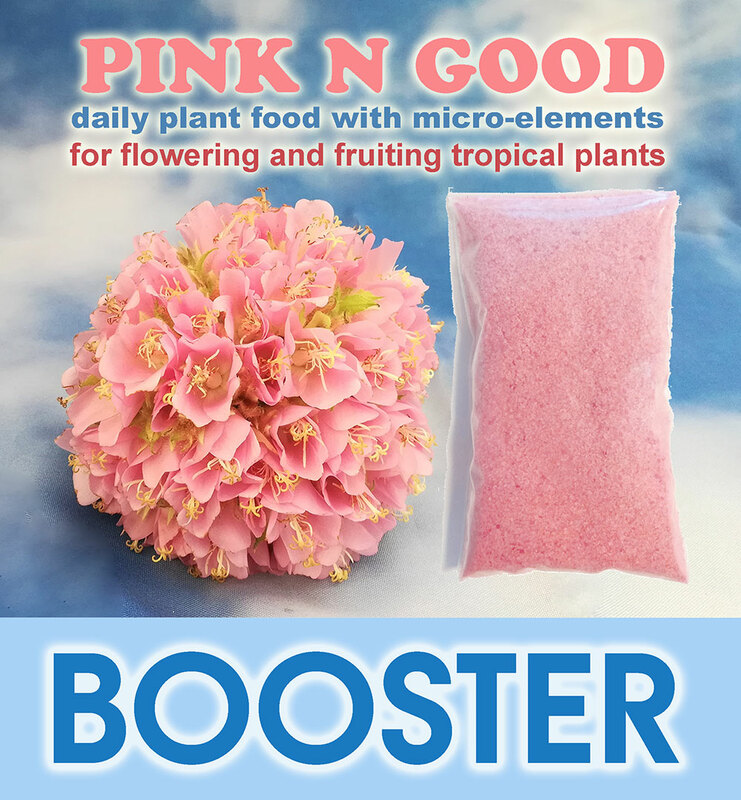 Great for bonsai. Pachypodium is a weird succulent with a thick, spiny gray trunk. They are scarcely branched and the base is spindle-shaped. 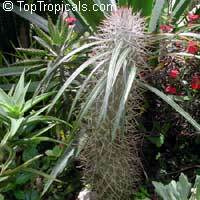 The trunk is covered with spines and the foliage is arranged spirally at the top. 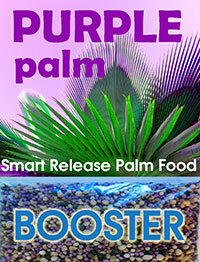 Use well drained soil mix. Barely cover the seeds. Keep warm and in bright light. Water when soil is nearly dry. 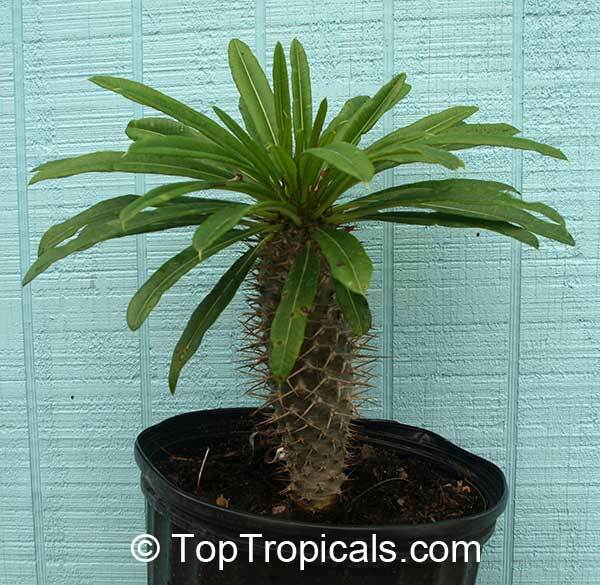 Madagascar Palm - a weird succulent with a thick, spiny gray trunk covered with 2 inch spines and the foliage is arranged spirally at the top. Water sparingly and do not fertilize. 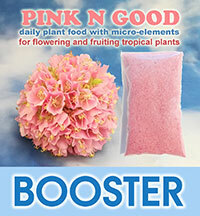 RECOMMENDED FERTILIZER: Adenium Plant Food - Flower and Caudex Booster. Madagascar palm. Very unusual plant! It looks like a "cactus with leaves". 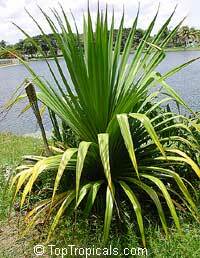 This plant has spiny columnar stem and whorl of leaves on top. 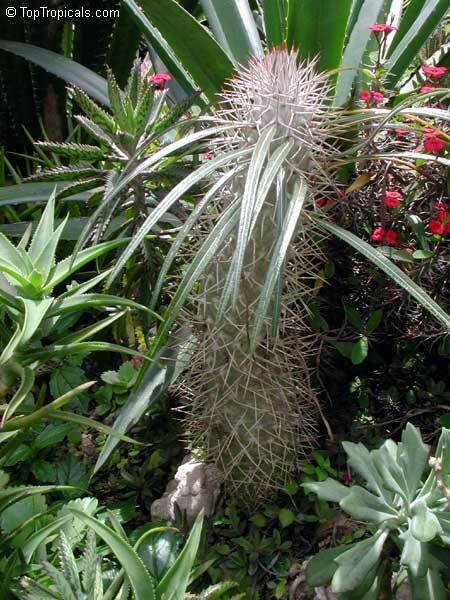 Short and thick succulent caudex branching into cylidrical arms dense with stout spines, and topped by a rosette of narrow oblanceolate leaves, and long-stalked sulphur-yellow flowers. Very rare plant! It looks like a "cactus with leaves". This plant has low thick caudex and yellow flowers. 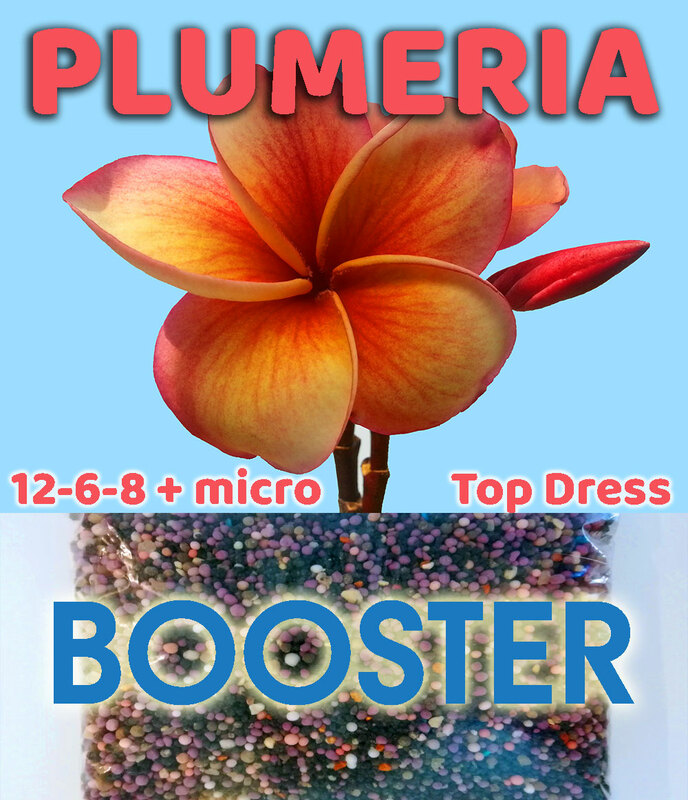 Great plant for bonsai! 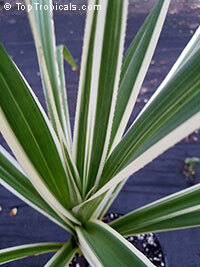 Madagascar Palm - large mature blooming size plant. Cardinals Guard. 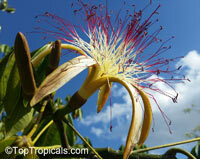 The inflorescence is very beautiful. 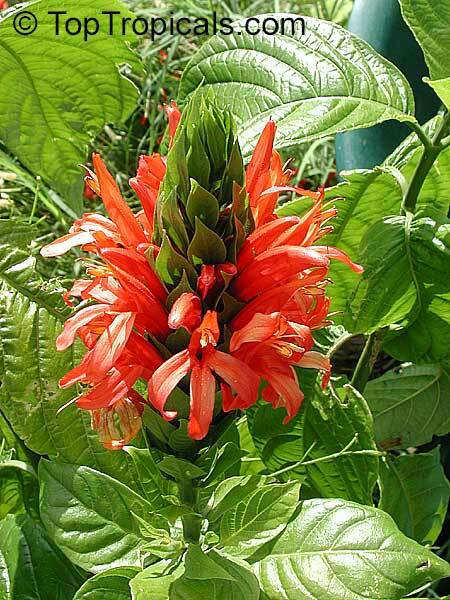 Bright red flowers emerging out of a green cone. The plant will flower most of the year. 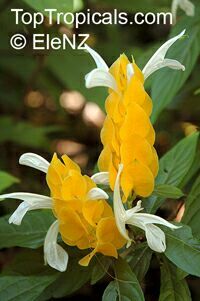 Yellow (Golden) Shrimp plant. 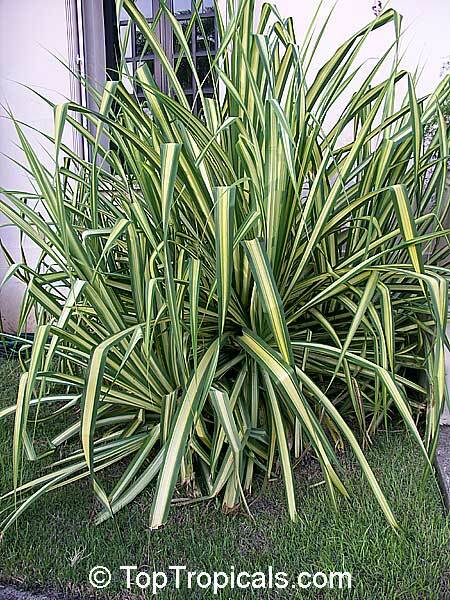 Please be aware this plant doesn't take shipping well. It may drop some leaves, but normally it recovers soon. Exotic rare collectible from Guiana. 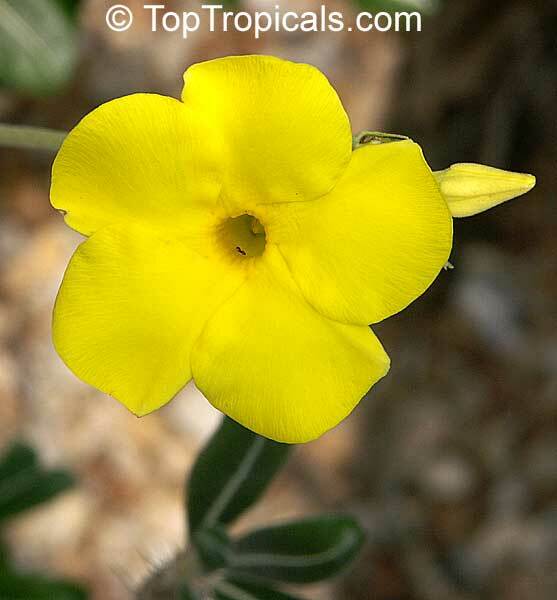 Flowers have well developed tubes, are brightly orange-yellow colored, and pollinated by hummingbirds. Nearly all Palicourea species are distylous; this appears to be the ancestral condition for the genus, though it seems that some species have been lost on the Caribbean islands. 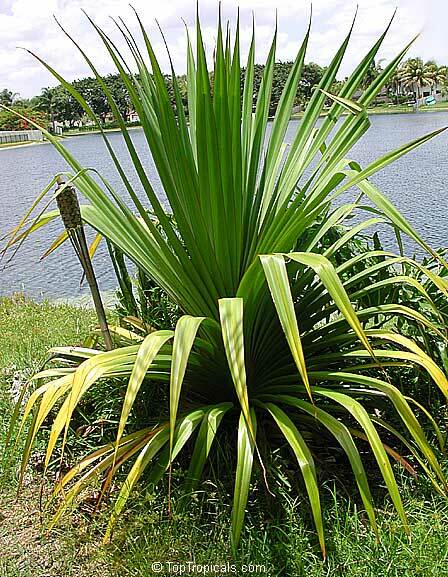 Dwarf form of favorite Pandanus with large heads of cascading green and yellow thin leaves. You can have a nice exotic Screw Pine as a dwarf in a pot. 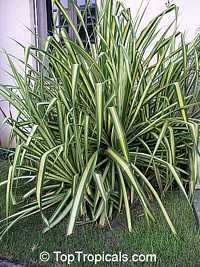 Dwarf form of favorite Pandanus with large heads of cascading bluish leaves with white outer stripes. 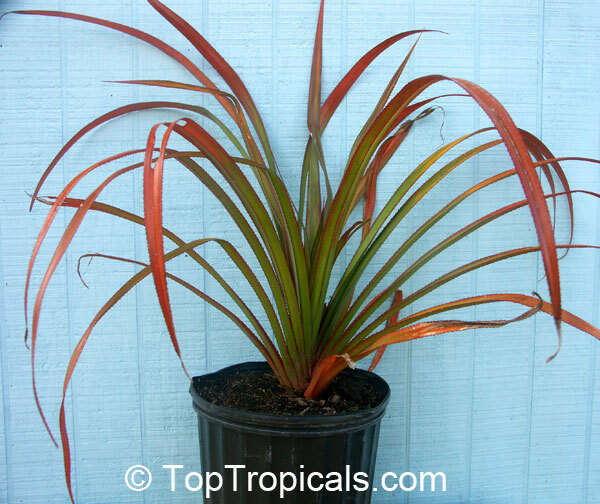 You can have a nice exotic Screw Pine as a dwarf in a pot. 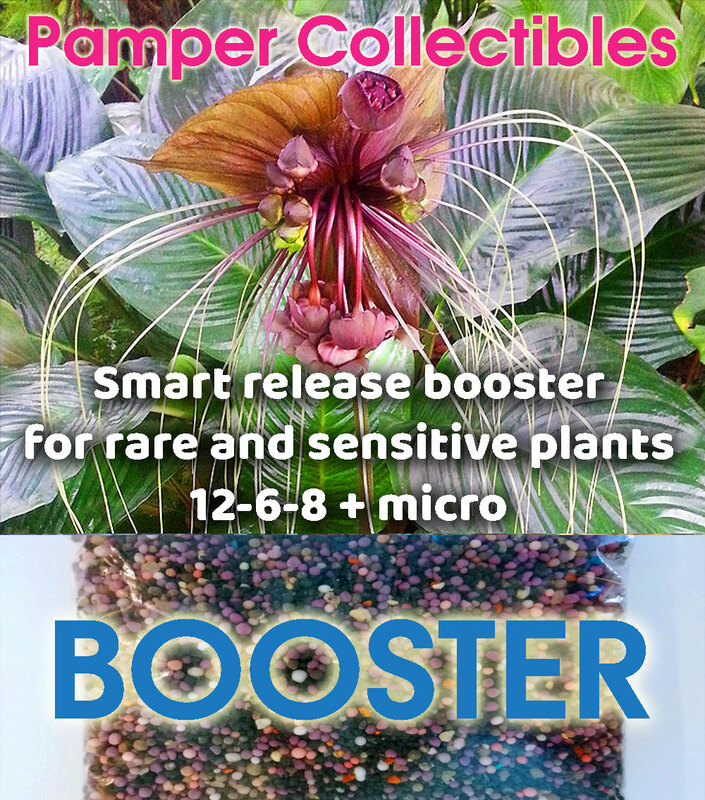 Its ability to thrive in less than perfect indoor gardens makes it a wonderful addition for the home or office. 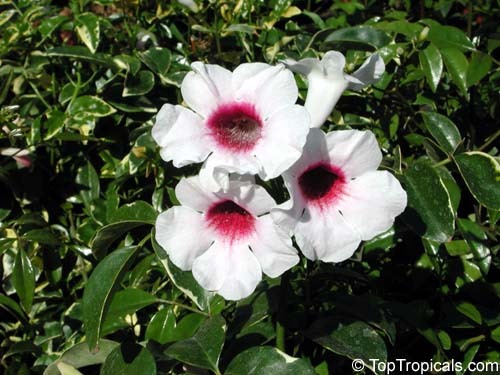 It is simply a spectacular and easily grown tropical treasure which can bring a touch of South Seas Indonesia within reach of anyone with such a desire. 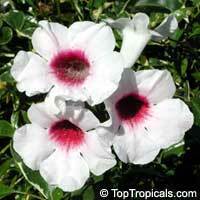 Pandora vine - light pink fragrant flowers with mulberry centers, controllable compact vine. 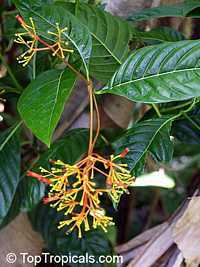 Parinari curatellifolia is an evergreen tropical tree of Africa, found in various kinds of deciduous woodland most frequently in poorly drained areas and inland at moderate altitudes. It is also known as Mupundu or Mobola Plum after the fruit, which is considered tasty and causes the tree to be spared when woodland is cleared for cultivation. 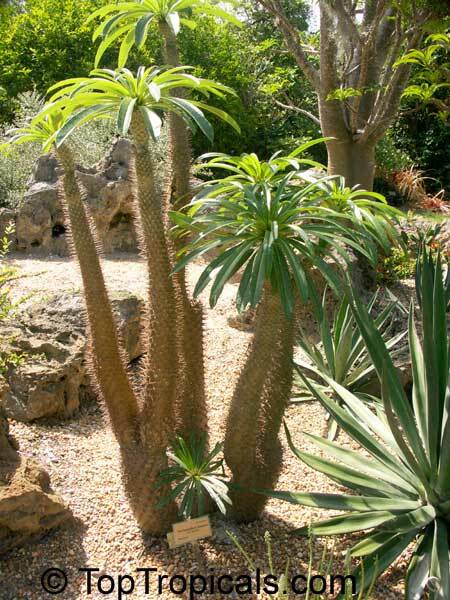 It grows in the Guinea Savanna region of West Africa from Senegal across to Chad and then in seasonal woodland across the Equator through Kenya and the eastern side of the continent in deciduous Miombo woodland inland to Zambia and Zimbabwe. A traditional food plant in Africa, this little-known fruit has potential to improve nutrition, boost food security, foster rural development and support sustainable landcare. 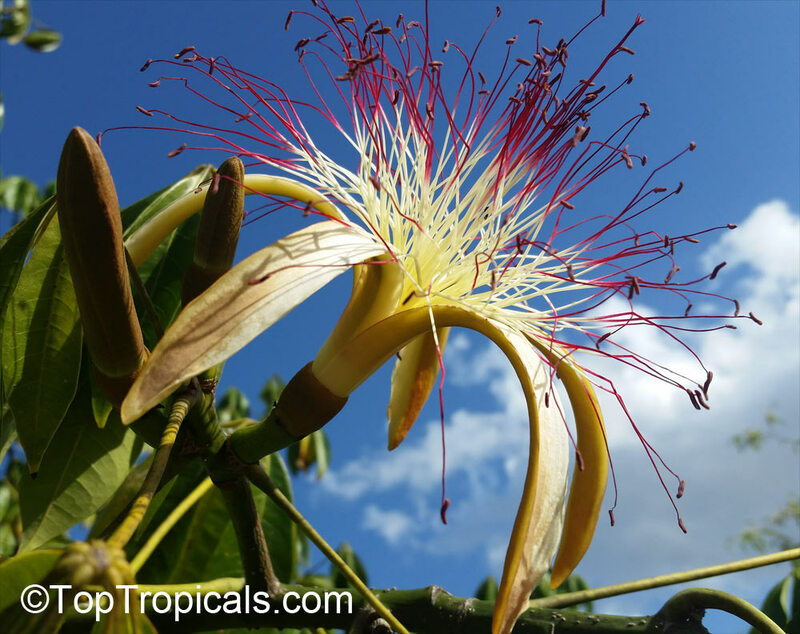 The main value of the tree is the delicious fruit, which appears early in the dry season and can be harvested over 3 or more months. 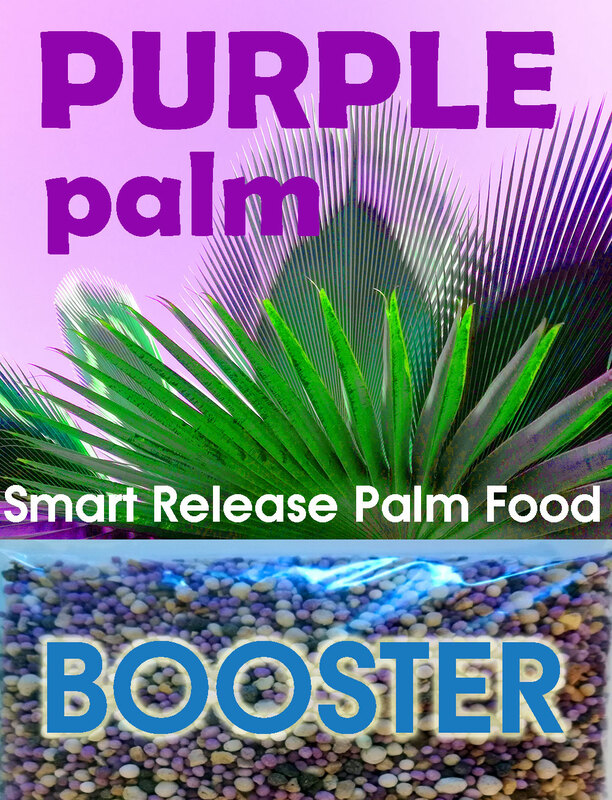 It is used a snack and the kernel has a high oil content. 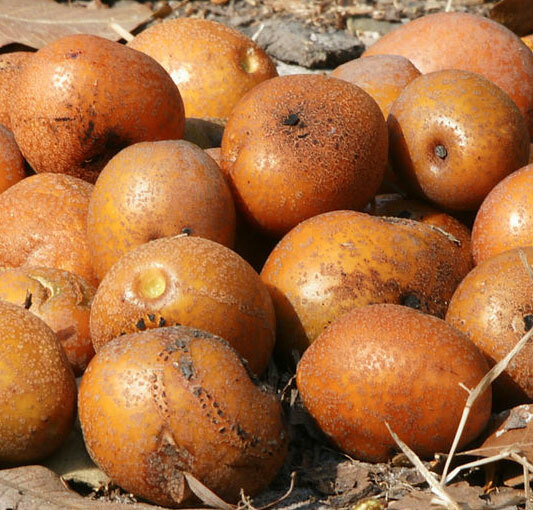 The crushed pulp of the fruit is an ingredient in drinks and since it ferments well, is often used to make alcoholic drinks as well. It is also used for faith healing by some indigenous churches in Zimbabwe. Jerusalem thorn is a hardy species and is valued as an ornamental or shade tree. 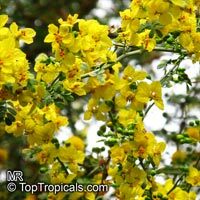 Its unique shaped leaves, pretty yellow flowers, shrubby weeping like habit, drought tolerance, and ability to grow in a wide range of soils makes it an appealing tree to grow. Parkinsonia africana is native to southern Africa (Namibia and Northern Cape). Small tree or shrub. 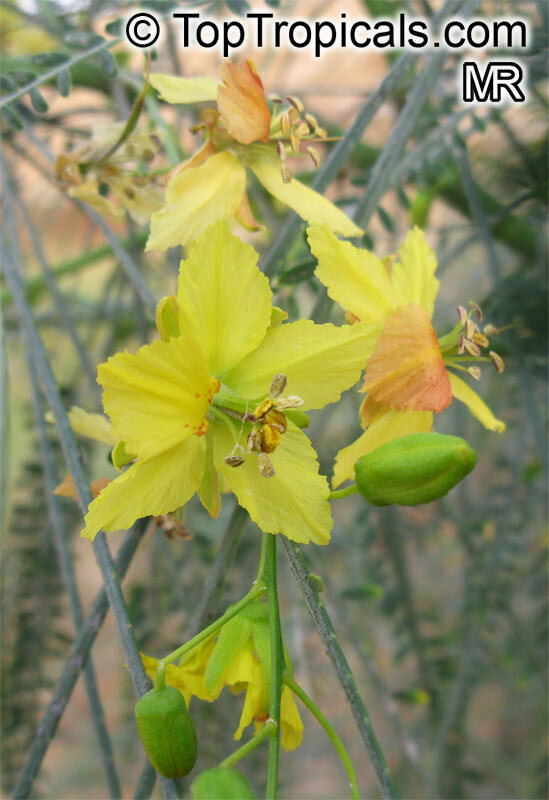 Guajilote, Guahalote - This highly ornamental tree is a conversation piece due to the interesting shape of its leaves and the greenish-cream flowers that grow directly from the stem or branch tips. 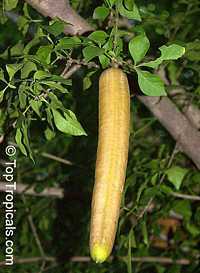 The 1 ft long fruit resembles a greenish-yellow cucumber. 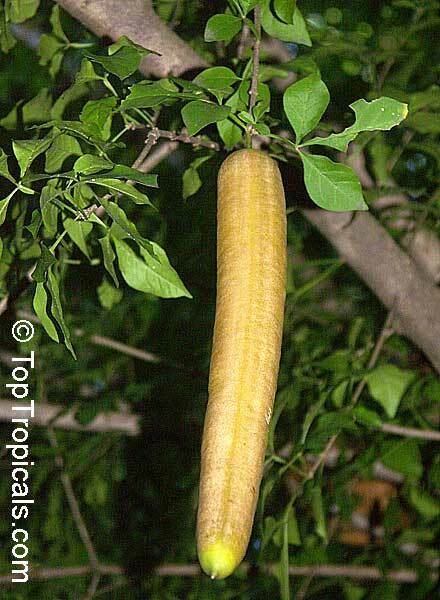 The fibrous fruit is juicy with a sweet flavor similar to sugar cane. 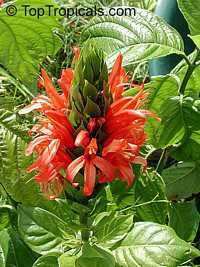 Barely cover seeds with well-drained soil mix, keep warm, damp and in bright light.